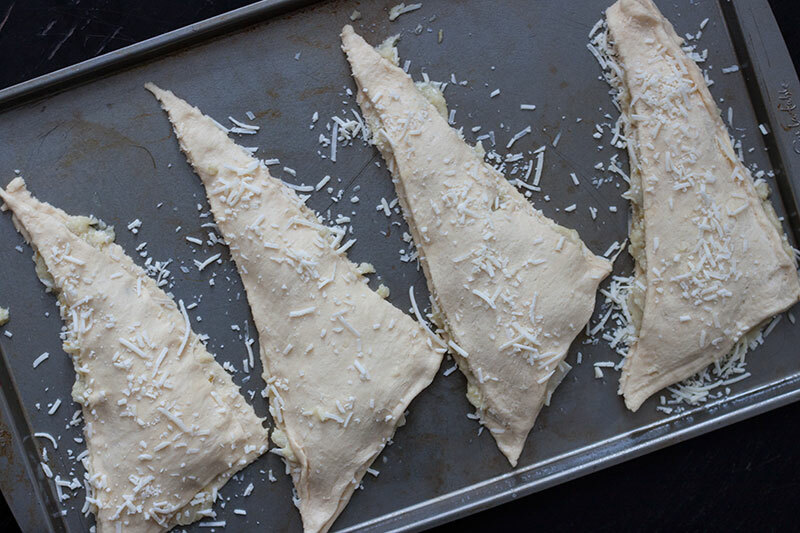 Yields 8 Turnovers but using 1 package of Pillsbury will yield 4, just cut everything else in half! Last weekend I locked myself in the house all day on Sunday to develop some fresh content for y’all. Although everything that I make DOES get eaten (no wonder I had to join the gym!) , I have to tell you, sometimes I just need something savory. I mean, don’t get me wrong, I LOVE ME SOME CUPCAKES, but I wanted to experiment with something that I would still love to make (small, pretty and baked of course) but maybe that I could have for lunch or din-din this week. I also wanted it to be something super easy that you could whip up any night of the week, and yielded enough to make it worth the dirtying of the dishes! I hate to say it (sorry cupcakes) but this was one of my favorite recipes so far. 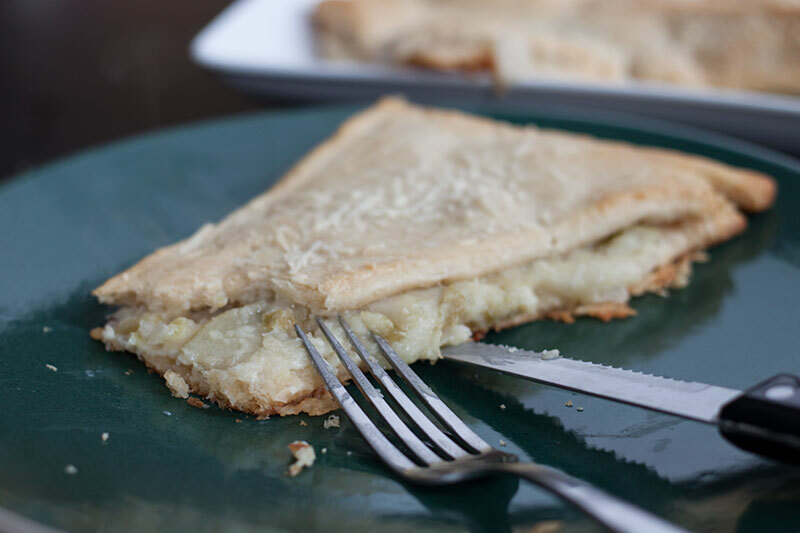 The butter flaky outside with the complex caramelized apples and onions- the sweet and salty comibation of apples and cheese... it was.... just perfection! You NEED to make this one. Super easy. Super yummy. You’ll thank me! If I’ve said it once, I’ve said it a thousand times, I am not in love with making pie dough. Its so tempermental! So to make this recipe easy-peasy, I decided to experiment with using some Pillsbury products, who doesn’t love a cresent roll! 1 / Preheat the oven to 350˚F. Lightly spray a cookie sheet with cooking spray. 2 / Cut the apples and onions into small- medium sized pieces. 3 / Place the onions, apples, butter and oil in a pot over low-medium heat. Cook the mixture, stirring frequently, for about 25-30 minutes, or until the onions and apples have caramelized and gotten super soft. 4 / Remove the mixture from the heat and let cool slightly. Pour the mixture into food processor (or blender) and chop until about the consistency of a thick applesauce. 5 / Lay down the crescent rolls onto prepared cookie tray (I had to do this twice, my cookie tray only fit 4 turnovers at a time). 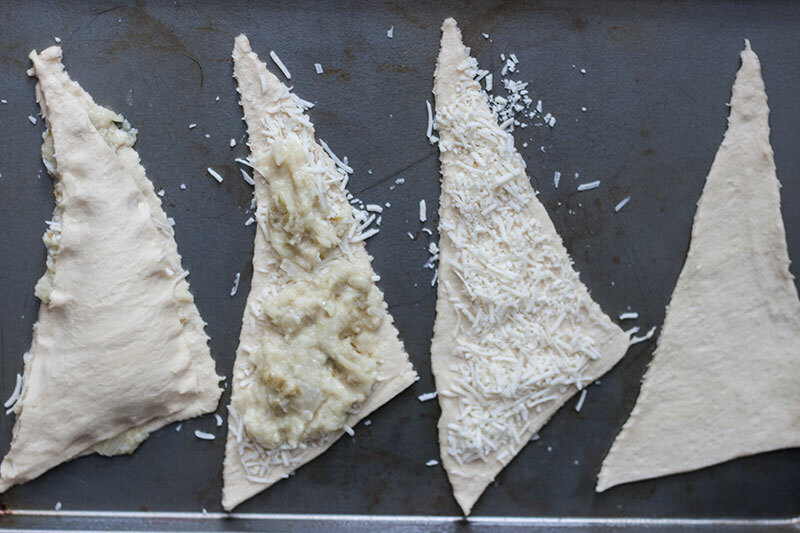 6 / Sprinkle the cheese over the crescent, leaving about a tiny edge around the ingredients so you can seal them up! 7 / Spoon the apple/onion mixture onto the cheese. 8 / Place another crescent roll onto of the other ingredients and press lightly along the edge to seal. Sprinkle additional cheese on top (optional). 9 / Bake for 20 minutes, or until the top edges of the turnover begin to turn golden brown. Serve warm. I ate one straight out of the oven and it was divine. I also wrapped them individually in foil and stuck 'em in the fridge and grabbed one out the door for work every morning. I have been switching off, eating cold or warm, breakfast or lunch, it works any way you choose! I’m telling you, you need to make these, trust me! Have you ever experimented with using premade doughs like this? Tell me more!